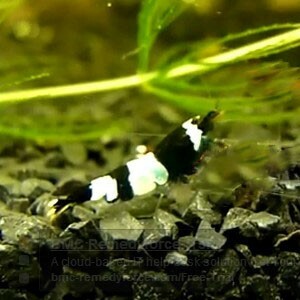 Panda shrimp are a bee shrimp variety appreciated by aquarists for their bright coloration. Although they definitely aren't the easiest dwarf shrimp to keep they are worth a try for the more experienced shrimp keeper. With the right care they can thrive and be a real eyecatcher in any shrimp collection. Keep reading for everything you need to know about panda shrimp and keeping panda shrimp in your own aquarium! Scientific name: Caridina cf. cantonensis var. "Panda"
Although panda shrimp definitely aren't the easiest Caridina cantonensis variety to keep, it's possible to keep them happy and healthy as long as you strictly follow their care guidelines. For most dwarf shrimp an aquarium of at least 5 gallons is recommended, but things are a little different for pandas. Larger setups are more stable, which comes in handy with these fragile shrimp. An aquarium of 10 gallons (preferably even more) is a good idea, especially if you're worried about water quality. Your aquarium should always be fully cycled. Use one or multiple sponge filters or any other type of gentle filter with a filter guard. A heater is also recommended: these shrimp do well at room temp but a heater protects them from sudden temperature fluctuations. As with all shrimp, pandas need plenty of hiding places to feel safe. Try adding some easy aquarium plants like Java fern and a few shrimp hides to help keep your panda shrimp happy. In order to keep your panda shrimp healthy, water quality should always be high. Any traces of ammonia or nitrite can be deadly, so check your water values very regularly using a liquid test kit to verify the cycle is still stable. Stay on top of your water changes, as nitrates can also damage the shrimp in higher quantities. Be sure to match the new water to the old and don't change too much water at a time. As Planet Inverts describes, although neutral pH and relatively high temperatures are preferable for panda shrimp, these conditions are also appreciated by pathogens. These vulnerable shrimp can easily fall prey to infections, which means it might actually be better to go for a slightly lower pH and temperature. That way there are less pathogens to worry about and the shrimp population is safer. In short: water quality and stability is everything. Keep it in mind at all times if you want your pandas to thrive. I think most aquarists can be brief about this: no fish with your panda shrimp. It's just too much of a risk; with their fragility and slow breeding you really don't want to lose any fry. There are a few invertebrate tankmate options. You can try small snails if you're sure they're not carrying any diseases. Other (dwarf) shrimp can also work as long as they don't interfere with your breeding program. Neocaridinas like cherry shrimp are 100% harmless, don't interbreed with Caridina cantonensis and should combine well with your pandas. All aquarium shrimp naturally feed on biofilm that grows on rocks and other surfaces. In the aquarium their diet should be supplemented with a high quality shrimp food. To add some extra variety you can also feed things like fresh blanched vegetables, frozen foods and much more, although pandas are often said to be a little picky when it comes to food. Be sure to remove any uneaten foods from the aquarium after a few hours to avoid issues with your water quality. Breeding panda shrimp is definitely not the easiest thing, although they are not as difficult as some of the other Taiwan bee varieties out there. Keep in mind that breeding panda shrimp to other panda shrimp might not result in success, as the offspring can be too weak to survive. Figure out your breeding goals beforehand and choose which shrimp to breed your pandas to accordingly. Other Taiwan bees and Caridina cantonensis species should work well. In essence, the breeding process is the same for all dwarf shrimp, pandas just aren't as fertile. Females (which are larger and more brightly colored) carry small eggs between their swimmerettes for around 30 days. The fry, which look exactly like tiny versions of the adults, don't need extra care but high water quality is very important to keep them alive. Panda shrimp are not too easy to breed, which means they aren't the most common shrimp in the hobby. Your local aquarium store usually won't carry them, but you might be able to obtain some from a fellow hobbyist or from an online source. The Shrimp Farm sells panda shrimp and ships them right to your doorstep! You can order your shrimp here. Keep in mind that panda shrimp look similar to Crystal Blacks. Make sure you don't buy the wrong shrimp! Pandas have intenser coloration and a black face, whereas CBS often have less opaque colors and a their face isn't colored.